This presentation by Theatre Y and director Georges Bigot is a part of Shakespeare 400, a yearlong commemoration of the Bard's death. Macbeth - Tony Adler, Chicago Reader 10/20/16 "As a veteran of Ariane Mnouchkine's legendary Théâtre du Soleil, French actor/director Georges Bigot can claim impressive avant-garde bona fides. The mere fact that Chicago's Theatre Y was able to collaborate with him in developing this idiosyncratic Macbeth is impressive. But the onstage result is an exasperating grind. The piece starts out interestingly, with the witches ("When shall we three meet again?") presented as hippie chicks, alternating between sweet nothings and vicious roars while backed by a 1950s pop hit, the Diamonds' "Little Darlin'." Their scenes remain creative respites throughout. But virtually everything else here is built around an elementary opposition-false facade vs. savage reality-that first grows tedious and then, given the technical shortcomings of some of the players, ludicrous. It's telling that in Bigot's hands Shakespeare's briefest tragedy comes in at three hours"
In the 19th Century, France gave the world de Tocqueville to explain the uniquely American spirit. Now, with Theatre Y as his tour guide companions, French Actor and Director Georges Bigot explains America to Americans in this year-in-the-making rendition of Shakespeare's MACBETH. This expositon on the American soul starts in the very opening scene when we meet the three witches (Kevlyn Hayes, Melissa Lorraine, and Laurie Roberts) frolicking to American rock n'roll (Little Darlin' by The Diamonds). With bare midriffs adorned with blood-red biological symbols for female, a "nasty" scribbled on one torso and another with a super swollen pregnant belly, these comely witches figuratively exude "blood from their wherevers" with every gyration. Whereas Shakespeare gives these witches the job of delivering portents of the drama to come, Bigot's direction overlays with a timely question, "Too much estrogen for ya?" Subtitled "Fear in the Night"
And so it continues throughout the production. It gets downright eerie when a victorious Macbeth (Brendan Mulhern) and Lady Macbeth (Katie Stimpson) seem to channel Trump Jr. and Ivanka at the Republican Convention. This telling of Macbeth subtitled "Fear in the Night", gives us the American spirit of today-reptilian and roiling. Though the acting is almost uniformly top-tier, it is the stagecraft that steals the show. From those first notes of so American rock n'roll, music overlays continue to harken Americana, for example with Copland's "Fanfare for the Common Man". Trumping this (all pun intended) is the use of scratchy drawn violin strings, insistent drums, and other sound effects synchronized with precision to the action on the stage. (Sound editing and composition: KG Price). Often--such as when charismatic Brendan Mulhern in the title role crumbles his neck and torso to the cacophony of atonal strings--you'll find your eyes wandering stage left to the darkened on-stage music pit that seems to be moving the actors like marionettes. That so many of the actors can dance and move as well as they can make Shakespeare's lines ease out like TV sitcom scripts greatly helps. You'll especially notice this in the performance by Katie Stimpson as Lady Macbeth- from her first sultry entrance emerging from the diaphanous curtain to her final suicide pose. Then again, when you hear her spit out her disdain for her husband's nature being too "full of the milk of human kindness" you too may wonder why every other Shakespearean actress perhaps underutilized the power of this line. You also see choreographer's instincts at work when Malcolm (Hector Alvarez) leads his fighting ensemble to battle or when Macbeth and Macduff (Jerome Hicks) duke it out. For the many Chicagoans who rejoice in Chicago Shakespeare Theater's ability to make the language of Shakespeare's time highly accessible, know you will find such in this production too, and perhaps more so. This is very easy to follow. Mulhern's expressions alone telegraph the action and emotional contents underlying them in most of the scenes. That said, if you aren't already familiar with Shakespeare's Macbeth and won't at least make time to read the Cliff Notes this probably isn't your show. On the other hand, it strikes this reviewer that Theatre Y's "MACBETH-Fear in the Night" is one of those rare productions that one might like to see more than once, especially if your first viewing was before November 9"
Macbeth - Hugh Iglarsh, NewCity Chicago 10/19/16 - "With this modern-dress version of "Macbeth," Theatre Y reconfirms its status as one of the city's most adventurous troupes and a conduit to the European performance scene. For this production, the company snared veteran French theater artist Georges Bigot to direct. He and his cast of eighteen give us a Scottish play that feels very new yet is faithful to Shakespeare's words and thematic intentions. In a prefatory note, Bigot refers to "Macbeth" as "a tragedy where each word is a painting." And some of the tableaus he has created are striking indeed, from an initially exultant Lady Macbeth dancing to the strains of "Que Sera, Sera" as she learns of the witches' grandiose but double-edged prophecy, to her final appearance as a sleepwalking zombie reduced to a guilt-haunted living death. The troupe rehearsed the play for a year, trading parts for most of that period. The result is a tight, flowing ensemble in which actors freely double as musicians, using a variety of percussion instruments to create a creepily effective background soundscape, designed by KG Price. In other scenes the cast turns into a kind of mechanical chorus line, depicting the forced normality of protocol masking the subsurface violence and terror. At moments when the ravens are cawing, the drums are beating and the night seems all-engulfing, the production achieves an arresting and almost hallucinatory intensity, combining movement, music and Shakespeare's heightened language to return to theater's archaic, ritualistic roots. Occasionally the primitive mood clashes with pop-culture allusions, including clunky references to Stanley Kubrick's "A Clockwork Orange" and "The Shining." And while Brendan Mulhern and Katie Stimpson are both riveting as the murderous Scottish power couple, many of the characters seem more like eager, well-scrubbed grad students than hardened thanes and kerns. The witches in particular disappoint, their effort to break through the fourth wall and connect directly with the audience marred by a teasing self-consciousness. Performative gimmickry is hardly necessary for a play like "Macbeth," with its timeless depiction of the unholy trinity of evil, madness and power. Despite its flaws, this is a must-see production in an election season that often feels like a real-life Halloween horror show. TheatreByTheNumbers.com, Sarah Bowden - "Macbeth the Scottish and "Macbeth" the Scottish play bear a tricky relationship to one another. Macbeth the king was a historical figure, but Macbeth the lead of Shakespeare's tragedy deals with far too many witches and witchy prophecies to match the factual record. Throw in the fact that sixteen generations of actors - according to director Georges Bigot - have now played Macbeth, and the truth of his life and death gets even fuzzier. Which is perhaps the way Theatre Y prefers its Macbeth, in their production currently running in the basement of the Chopin Theatre. Anchored by Bigot and an ensemble that rehearsed the play for a year, and only cast roles three-quarters of the way through that process, this "Macbeth" is beautifully painted but still impenetrable. But that is not due to lack of effort and visual panache; it is due to lack of textual dexterity. The ensemble tries to draw parallels between our time and Macbeth's tale of ambition and existential crises, but the resonance vanishes once it becomes clear some of the actors do not know what they are saying, and that still images and lip-syncing outweighed examination of the text. For those who have never had the pleasure of reading or seeing "Macbeth," here is the basic plot outline: our protagonist is a Scottish thane (Brendan Mulhem) who runs into three witches (Kevlyn Hayes, Jackie Richards, and Laurie Roberts). They tell him he is fated to be king of Scotland, and that his friend Banquo (Cody Beyer) is fated to sire kings. Spurred on by this prophesy, Macbeth and his more opportunistic wife (Katie Stimpson) murder the current king Duncan (Arch Harmon). Heir to the throne Malcolm (Hector Alvarez) flees the country, and only vows to return and regain his crown once the warrior Macduff (Jerome Hicks) stands by his side. Meanwhile, Macbeth arranges the murder of many more people, in order to ensure his new title. This is a play of immense uncertainty. Why do the witches appear to tell Macbeth about his future? Would he still become king if he didn't murder his way into the position? Why is Lady Macbeth so steely before their crime, and what makes her unravel entirely after its completion? Can truth ever be discerned, when men are able to smile in spite of their malicious actions? Even the language of the play is confounding: "which is which;" "So foul and fair a day I have not seen;" the Porter's speech on equivocation doesn't resolve itself so much as peter out. People hear and see things, but the audience can never be sure if birds are crying, or if the Macbeths are jumping at shadows. Bigot's best work as a director comes in moments where characters fight the intangible. He is wise to have Macbeth grasp at a knife that does not exist, and then to have Mulhem whirl around the stage to keep from getting cut by his invisible foe. Likewise, the parade of kings that Macbeth sees under the tutelage of the witches happens in his mind's eye, which allows the audience to take heed of his growing paranoia and psychosis. Moments such as these make for a hallucinatory experience. The audience is Macbeth's ally throughout; he speaks to us more than anyone except his wife. But he also sees what we cannot, thus proving there is uncertainty in our relationship. Is Macbeth inspired by false prophecy? Is he mad? Or is he seeing true events that will come to pass? We can never know. This production falters in its grander visual elements. The witches lipsync a Diamonds' song early on in the play, and Lady Macbeth drags her fingers across a curtain sinsterly, all before performing a dance of her own and reading about Macbeth's possible future. At other moments, she and Macbeth smile robotically while entertaining guests. Some of these flourishes underline the false faces of the characters, but more often, the sights and sounds put Macbeth in inverted commas. We are watching a production of "'Macbeth,'" not your run of the mill "Macbeth." But the spectacle rarely informs the audience. Rather it draws the play out to a two hour forty-five minute run time that taxed my good will as an audience member. I also sense that visuals took precedence over looking at the thesis and antithesis in the verse. Rarely have I understood so little of what actors were saying in a Shakespeare play. I should single out the performances that imbue the play with high stakes and deep meaning. Beyer as Banquo is recognizably human, and his command of poetry helps the audience see the rock and hard place he is stuck between as Macbeth's rival. Hayes is remarkable as Lady Macduff late in the play. She does not overplay her grief or underplay the danger she is in; she focuses on her son, and her death sticks with the audience once she is gone. Mulhem has a great voice, but his increasingly erratic Macbeth made it hard to follow his thought patterns, especially in the "sound and fury" soliloquy. Stimpson located an intriguing fear in Lady Macbeth early on that vanished before her death, and I was sad to see her insecurity go unexplored. Michael Rathbun's light design gave the performance a lurid sheen. His use of low-placed lights to highlight internal monologue gave the actors a stark look, and his use of reds and purples during the banquet and murder scenes sold the carnage in the Chopin's intimate space. KG Price's sound editing provides jaunty themes for the characters, and the peppy music lends a creepy vibe to the whole play. The costumes by Branimira Ivanova set the play in a distinctly Kennedy Camelot-setting once action moved back to Dunsinane, an interesting contrast to the contemporary army fatigues that pepper the battlefield scenes. This play may not be for everyone. If you are in the mood for a sight-heavy "Macbeth," this production is your best bet. If you are looking for a clear examination of the play's dark center, you might be better off reading the text on your own". Macbeth, Michaelle Bradford, BuzzNewsChicago.com- "Out damned spot out..." This line tragically uttered by Lady Macbeth is probably one of the more memorable lines in Shakespeare's Macbeth and it also was one of the more memorable moments in Theatre Y's production now playing at the Chopin Theatre. The role of Lady Macbeth, played by Katie Stimpson, really comes to life as she deftly portrays the deceptive, ambitious and manipulative wife who urges her husband Macbeth (played by the equally talented Brendan Mulhern) to commit the treasonous act of murdering the King of Scotland in order to fulfill a prophecy, told to them by a trio of witches, that one day Macbeth would be king. But the weight of her duplicity plagues her with misery as she has bouts of sleepwalking and envisions blood stains on her own hands: "Out damned spot out..." Stimpson plays the role with such an ethereal quality that the vacillation between the blood thirst of Lady Macbeth's ambitions from the play's opening to the tortured consequences of those actions has a lot of resonance. Also, Mulhern's physical approach and embodiment of the role shows the depth of Macbeth's paranoia and guilt over his own actions and weakness. The scene where Macbeth imagines seeing the bloody dagger hanging in the air, though invisible to the audience, is a perfect example of the type of energy he brings the role. Even without the use of a prop, it is quite visual in its depth and impact. 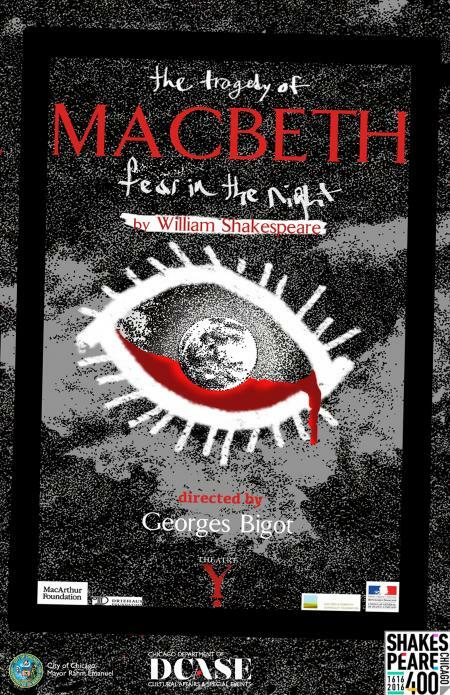 This production of Macbeth, part of the year-long Chicago Shakespeare 400 International Arts Festival, was directed by French actor Georges Bigot. He has performed a number of classic roles from Greek tragedies to Shakespearean plays including Twelfth Night and Henry IV as well as directed about a half dozen plays including Chekhov's "The Seagull" and a Khmer adaptation of Norodom Sihanouk. Bigot provides a very interesting interpretation of the classic starting with a dark and foreboding set. Props are sparse and much of the action and energy are purveyed through the physicality of the actors. An improvised "orchestra pit" sits over to the side providing musical interludes both live and recorded. The costume design by Branimira Ivanova is an interesting mix from the camouflage military uniforms worn by the soldiers in the opening scenes to the modern dress clothes at the party at Macbeth's castle as well as the somewhat Hippies style of the three witches. A fascinating tidbit about this play is that it was rehearsed for nearly a year and the brand new Theatre Y Ensemble was birthed out of the process. "This production of Macbeth is the fruit of a laboratory that began a year ago and which is still ongoing," Bigot says in his director's note. "I wanted to impart the spirit of an ensemble that would 'do theatre in the Public Service,' a spirit I first encountered at the Theatre du Soleil in Paris, but which I recognized instantly in the artists I was able to gather at Theatre Y." The chemistry of the cast was certainly a plus in pulling off some of the most complex scenes including the ending fight scene between Macbeth and Macduff"